Charlotte Corday (Marie-Anne Charlotte de Corday d'Armont, 27 July 1768 – 17 July 1793), was a figure of the French Revolution. In 1793, she was sent to the guillotine for the assassination of Jacobin leader Jean-Paul Marat. She blamed Marat for the more extreme course the Revolution had taken. He played a large role in the takedown of the Girondins. Corday believed in the Girondins' cause. In 1847, writer Alphonse de Lamartine gave Corday the nickname l'ange de l'assassinat (the Angel of Assassination). Charlotte Corday was born in Saint-Saturnin-des-Ligneries, Orne in Normandy, France in 1768. Corday was from a family of minor aristocrats. When Corday was a girl, her older sister and their mother, Charlotte Marie Jacqueline Gaultier de Mesnival died. Her father sent Corday and her younger sister to a convent in Caen. In the convent's library, Corday read the writing of Plutarch, Rousseau, and Voltaire After 1791, Corday lived in Caen with her cousin, Madame Le Coustellier de Bretteville-Gouville. They were very close. Corday was going to inherit her cousin's estate. As the French Revolution became more and more extreme, Corday began to support the Girondin even more. She loved their speeches and liked many of the Girondins she met in Caen very much. She decided that she needed to do what the Girondins were doing. She thought that they were the party that would save France from the radicalism of the Jacobins. The Jacobins believed that France would be saved only by terrifying the people into obedience. They believed that violence was the only way. Corday and the Girondins did not agree with this approach. Corday decided to kill Marat, because she believed he was the most radical. She believed this because she blamed him for the September Massacres. Jean-Paul Marat was a member of the radical Jacobin party that led the Reign of Terror. He wrote an important and widely read newspaper called L'ami du peuple (the Friend of the People). Corday also blamed Marat for the civil war she thought would happen in France. She believed that Marat was bad for the future of France and that his death would stop the violence in France. She also believed that Louis XVI should not have been executed. On July 9th, 1793, Corday left her cousin's estate and went to Paris, where she bought a knife. At her hotel, she wrote a letter to the French people. In the letter, she explained why she had killed Marat. She called it Addresse aux Français amis des lois et de la paix ("Address to the French people, friends of law and peace"). At first, she planned to assassinate Marat in front of the entire National Convention. However, Marat did not attend meetings anymore, because of a skin disease. She changed her plan and went to his home. The first time she came, Marat's wife, Simonne Evrard, did not let her come in. When she came back in the evening, Marat let her in. She gave him the names of Girondins in Caen, and he wrote them down. Then, she stabbed him with the knife she had bought. Marat called "Aidez-moi, ma chère amie!" ("help me, my dear friend!") to his wife and died. David, one of Marat's friends painted Marat's body. The painting became famous. The moment was also painted by Baudry. Four days after she killed Marat, Corday was execution via guillotine. Corday's plan worked, but it also failed. The violence in France did not stop. 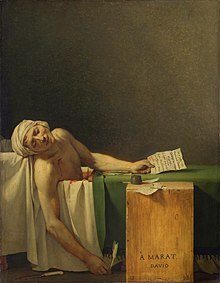 Marat became a martyr. ↑ Whitham, John Mills (1968), Men and Women of the French Revolution, Freeport, NY: Books for Libraries Press. ↑ "La Procès de Charlotte Corday." Ministère de la Justice. La Gouvernement Français, 23 Aug. 2011. Web. 19 Sept. 2014. ↑ "Jacques-Louis David: The Death of Marat." Neoclassicism and the French Revolution. Boston College, n.d. Web. 19 Sept. 2014. ↑ Clegg, Melanie. "Charlotte Corday, 17th July 1793." Madame Guillotine. N.p., 17 July 2011. Web. 19 Sept. 2014. This page was last changed on 11 November 2014, at 17:33.